Unified Service Desk for Microsoft Dynamics 365 provides a configurable framework for quickly building applications for call centers so that agents can get a unified view of the customer data stored in Microsoft Dynamics 365. You can aggregate customer information from different areas in Dynamics 365 into an integrated desktop that provides a 360° view of the customer interactions. This gives your customer service agents immediate access to business critical information so they can quickly engage with customers and address queries and issues. Unified Service Desk, which is built using the User Interface Integration (UII) framework, is designed as a series of adapters and modules that facilitate management of Dynamics 365 UI elements (such as pages and dialogs), automatic loading of related records, agent scripting, a configurable toolbar, and so on. Unified Service Desk can be configured and administered using Microsoft Dynamics 365 or Microsoft Dynamics 365 for Outlook. Using Unified Service Desk to configure agent applications doesn’t require you to write code for the most part, and therefore reduces the lead time to design an agent application as per your business requirements. Also, with the computer telephony integration (CTI) framework of UII, organizations can build adapters to connect Unified Service Desk with their existing CTI infrastructure to support customer communication in agent desktops over various channels such as chat, email, or telephone. What makes up Unified Service Desk? Unified Service Desk leverages the power of the User Interface Integration (UII) framework to help you quickly configure a customized agent application. The UII framework lets you build and deploy composite agent applications that can provide unified access to customer information in Microsoft Dynamics 365 and external systems, and can aggregate different modes of customer interactions or channels. UII provides a framework for non-intrusive integration of existing line-of-business (LOB) systems at the UI level. For more information about how you can use UII, see Unified Service Desk and the UII framework in the Unified Service Desk Developer Guide. Unified Service Desk is a collection of solutions and data files that contain configuration entities and the underlying entities for the UII framework. You configure the Unified Service Desk entities to define the user experience in the client application, such as various controls, their layout, user flow, and so on. All configuration information is stored in the Unified Service Desk entities, and you can bundle it along with the solutions and data files into a “package” that defines a Unified Service Desk application. The package can then be deployed to any Dynamics 365 instance, and users can connect to it using the Unified Service Desk client application to experience the interface and functionality defined by the configuration data of the application. 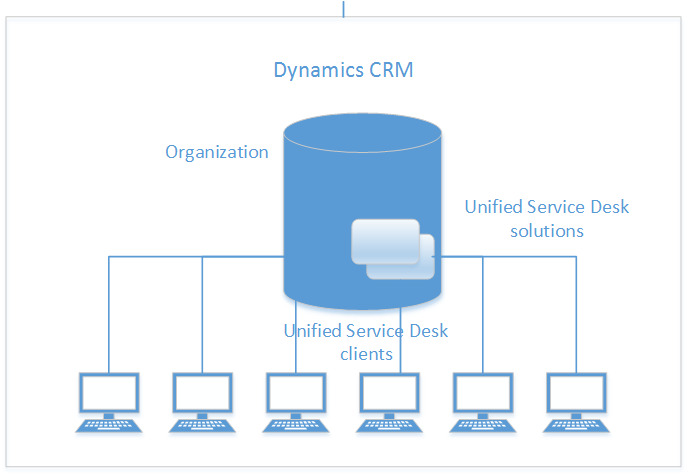 Dynamics Unified Service Desk: This solution file contains the primary Unified Service Desk entities that you configure to define the agent application experience. User Interface Integration for Microsoft Dynamics 365: This solution contains the underlying entities required by the Unified Service Desk configuration entities. For information about the core Unified Service Desk concepts, see Core concepts for configuring Unified Service Desk in the Unified Service Desk Developer Guide. Call center challenges and how Unified Service Desk can help?